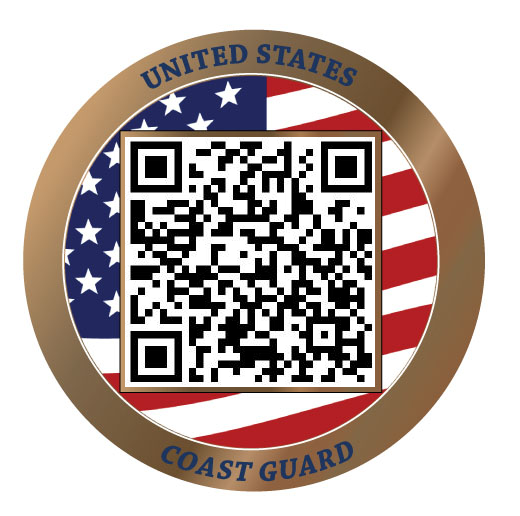 Coast Guard Vitae Coin® is a 1.75" diameter disk as shown with a QR code that when scanned opens a page telling the story of your loved one. The story may include a photo(s), video(s), history, obituary, biography, GPS coordinates, or whatever information the purchaser provides. The coin is 1.75" diameter, by 3/16" thick, and weighs 1.34 OZ (38 grams). You have a choice of four text colors: Red, White, Blue and Black. Choice of actual coin color: Copper, Silver, Brass, Gold, Bronze, Black Nickel or All White. *Is this coin for a veteran?